March 28, 1918, the Spring Offensive, outside Arras: as the enemy overruns them Sam‘s Company CO points a pistol at him then runs away… after that it’s “Germans, hundreds of them, charging in my direction bayonets fixed… ” and, to his astonishment, survival… maybe redemption? This week’s excerpt is in memory of two men who died in the past week: Malcolm Doolin, an inspiration at Walthamstow Western Front Association, and Foster Summerson, a mainstay of the Gallipoli Association and the WFA. My father would have deeply appreciated their work for peaceful Remembrance of the young men of all nations caught up in World War 1. A hundred years ago this week… the deadly Spring Offensive – casualties 234,000 Allied troops, 240,000 German (March 21-April 5) – roared towards its crescendo. Historians divide it into separate battles, though all were propelled by desperate defence against shifting German onslaughts, part planned long-term, part designed on the spot. The First Battle Of Bapaume (March 24-5) concluded with a confused day for the Allies as the Germans captured Libermont and Nesle, but the British counterattacked to retake the village of Baboeuf. After that Field Marshal Haig called for 20 French Divisions to move north and support his men; in response, a conference organised with remarkable speed at Doullens (26), only about 15 miles northeast of the nearest front-line point, saw Haig in purposeful discussion with French President Poincaré, British Prime Minister Lloyd George and British Munitions Minister Churchill as well as his military peers Generals Foch, Pétain, and Wilson. Foch emerged in charge of coordinating the Allied effort and, by stages, the French took over most of the Front south of Amiens. Thereafter, variously judicious, chaotic and lucky retreats and counterattacks saw the Allies, on the whole, at worst cede far less ground to the German Army than they needed in order to achieve their objective of winning the war at a stroke. Broadly, this applied to the Battle Of Rosières (March 26-7) and the First (some say Third!) 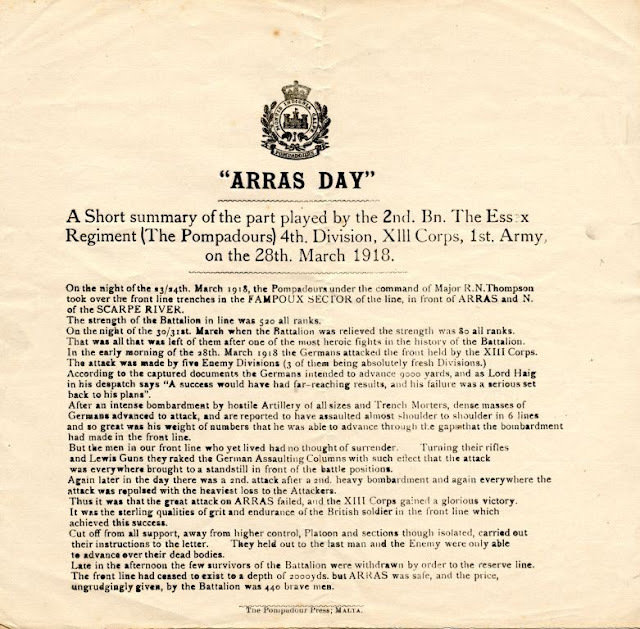 Battle Of Arras (28; my father, Sam, was there – see his continuing account of the day below), and the initial stage of the First Battle Of Villers-Bretonneux (March 30-April 5). In other, less significant encounters, in southern Russia the German Army (with seeming disregard for the Treaty Of Brest-Litovsk) captured Poltava, in Jordan Anzacs and British troops lost the First Battle Of Amman and retreated to the Jordan Valley (May 27-31), and in Mesopotamia (now Iraq) Indian troops defeated Ottoman forces in the Action Of Baghdadi (March 26-7) and moved on to take Ana (28) – which turned out to be the last Allied attack along the Euphrates. 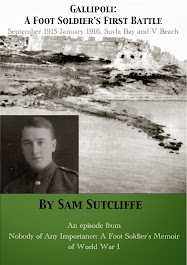 Last week, on March 28, 1918 – 100 years ago on Wednesday this week – my father Signaller Sam Sutcliffe, his pal Neston, and all their comrades in C Company 2/7th Battalion Essex Regiment followed the order received from HQ that midnight to fight to the last bullet – this despite the absence of any effective leadership above Sergeants and Corporals. With great waves of attackers coming their way, they fired and fired until their rifle bolts jammed and, indeed, they’d used up every bullet they had. 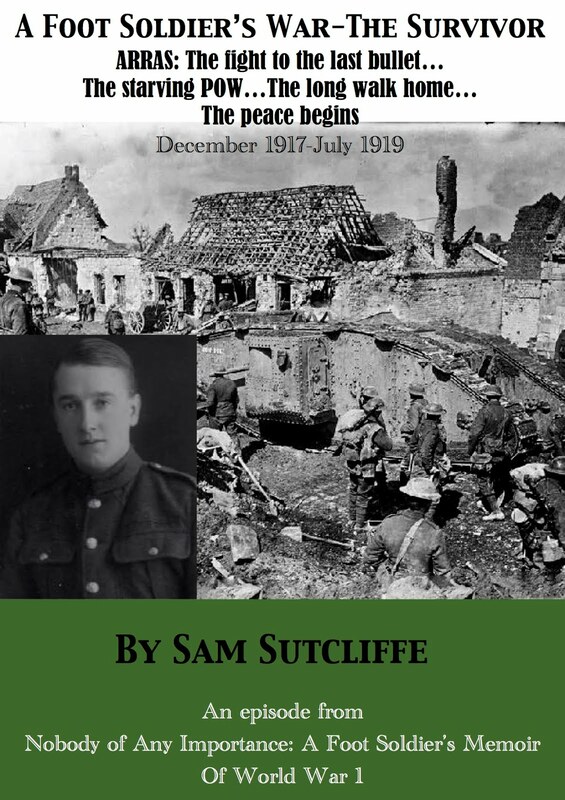 Sam’s boiling emotions included the fear he might “explode from within”, a bone-marrow guilt as he became aware that his “targets” were real human beings, and even moments of pride and satisfaction he felt “we were doing a soldier’s job reasonably well”. Finally, the Company remnants defenceless without ammunition, he and Neston struggled back to the dugout where they’d left their last means of communication – two ring-tailed doves – and attached messages each of them saying, essentially, “Goodbye” … to anyone at Divisional HQ who might be interested. ‘At this moment, from goodness knows where, possibly his screened-off “room”(2) in the dugout, our Company Officer suddenly appeared – his face, as before, strangely different from its usual coarse, sometimes good-humoured norm, showing signs of great nervous strain. Pushing us aside, he scrambled out of the trench on the rear side. Welcoming what we assumed to be belated leadership, we made to follow him, but he pulled his pistol from its holster, aimed it in our direction and ordered us to stay where we were… Strange repetition this, for up to that moment I had only been threatened with a revolver once and that too by one of our own people – our Regimental Sergeant Major did it at Gallipoli, you may recall, because, he said, we were attracting fire from Turk field guns by exposing ourselves (he too was in a windy condition and never lived down the bad name he earned there)(3). At that, the officer disappeared and Neston and I quickly decided to attempt to follow him. But, a few yards behind our trench, we slid into the protection of a shell-hole and had a brief chat. I reminded my pal about the message with its code word “George”, meaning we must not leave our position for any reason… Time passed. No one came our way. We heard only an occasional burst of machine-gun fire, usually from our support trench… We made our decisions, I to rejoin our lads, Neston to make a dash rearwards. We shook hands and parted(4). Running the few yards to our frontline trench, I stopped myself from dropping into it… only just in time. I stood looking down for a moment, both fearful and fascinated by what I saw. No British soldiers in that bay, just one German. 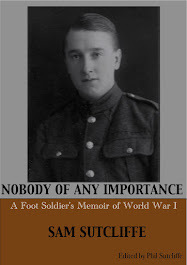 With the utmost concentration, he was carrying out what we knew as “the mopping-up routine” – having killed, wounded or captured most of the enemy troops occupying a trench system, you then looked for stragglers or obstinate fighters. With bayonet fixed on rifle you held it at your side, but somewhat forward; you advanced quietly, cautiously; when you came to a corner you paused, then sprang round that corner ready to stab or shoot. This careful process, plus throwing a hand-grenade down each dugout entrance, was the proven method of clearing a trench system thoroughly. For the second time that day, I was surprised to see Germans doing the same as we did. The German I watched was so taut and intent on his job he didn’t see me standing there above him. I should have tackled him immediately, but I didn’t. It appeared that any surviving members of our Company must already have been removed as prisoners. I heard spasmodic rifle and machine-gun fire to the rear. Probably, close fighting continued in the next trench back, the support line. I sprang over the head of the German and that carried me a couple of yards clear of the trench. Looking forward, I saw Germans, hundreds of them. A glance to the right made me abandon all hope of surviving. A line of Germans was charging in my direction, bayonets fixed on rifles, the job assigned to them, obviously, the destruction of any remaining opposition. They must, quite understandably, have felt bitter about the price we had extracted for their victory. A long delay like that must have interfered with their plans. I fleetingly hoped that none of them had witnessed my double slaughter… that I can recall(5). (2) This Lieutenant had spent most of the previous seven days since the Battalion’s arrival in the front line in a curtained off area of the large dugout where the Signallers and others worked. (3) See Blog 64 September 9, 1915, for this story. (4) Sam and Neston’s parting here may seem strange if you read Blog 192, two weeks ago, and recall their, albeit tacit, vow to “Stick together no matter what happens”. But only hours later they were bidding farewell – and as far as I know they never met again (Neston, an alias, may not have survived the day or the war, of course). But, talking about all this before he wrote it down, my father never expressed a sliver of resentment at Neston’s surely very sensible decision to get out of there while he, pointlessly, followed orders. But by then the battle, the flood of adrenaline terror and excitement had completely shattered him. That’s why, a few paragraphs on, he stood, numbed to inertia, awaiting his bayonet quietus. (5) See last week’s blog for the explanation of Sam’s “double slaughter” – the incident stayed with him for the rest of his life (he headed the passage “Murder”), but no doubt passed entirely unnoticed by anyone else in the course of the day’s butchery and mayhem. (6) Gregory Blaxland’s Amiens 1918 offers interesting detail on that March’s Battle Of Arras (not an official name I think, maybe I should call it ‘the battle outside Arras’) which explains the big picture within which my father’s little story played out; the Allies pulled much of their strength back beyond German artillery range leaving the front line as what they called “an outpost zone”, planning the most substantial resistance to the infantry attack for a “battle zone” well to the rear. According to Wikipedia, this worked because “Ludendorff continually exhausted his forces by attacking strongly entrenched British units” and consequently “At Arras on March 28, he launched a hastily-prepared attack (Operation Mars) against the left wing of the British Third Army, to try to widen the breach in the Allied lines, and was repulsed”. A detailed account of the day that concluded with my father’s survival (but behind enemy lines), and more generally, although my father and his fellow POWs didn’t know it, a great, very costly military success can be found at www.stanwickwarmemorial.co.uk/54.html — a site dedicated to tracking all the soldiers from a village called Stanwick, Northamptonshire (1911 population 922, of whom 152 enlisted in the armed forces 1914-18, many of them Essex Regiment members, and 36 were killed) it also generally reflects my father’s eyewitness-50-years-on memories; in part, reproduced with the kind permission of the site's webmaster Steve Bence aka Freddie Shawm, it reads: “On the 28th March 1918 the Essex Regiment were holding the left sector of the whole of the 4th Division front and indeed the extreme left of the Third Army where it joined the First Army boundary. The 2nd Battalion, Essex Regiment, was the front Battalion of 12 Brigade… At 3am there was heavy enemy artillery fire (high explosive and gas) on the Front, Support and Reserve lines. At 6am the bombardment became more intense but communications were still valid. At 7.10am the communications ceased and wire was cut. At 7.20am the German assault began. There was a breakthrough on the right and the front Companies fought on until ammunition was exhausted. Battalion H.Q. withdrew along Chili Avenue to its junction with Harry and Hussar Trenches. It was here that a strong point was established in conjunction with the Lancashire Fusiliers. The enemy did not penetrate further and though the position was for some hours critical in the extreme, with troops falling back on the right and the left, the line held. In this section of the line the Germans mighty effort to capture Arras had been thwarted. They were only able to advance a distance of less than 2,000 yards. That same night the 2nd Battalion, Essex Regiment moved back to Athies [two miles east of Arras]. There were 5 officers and 75 men as survivors from the 500 men who were alive in the morning of the 28th March 1918. Stanwick’s Pte J G Morris was killed on that day. A fortnight later these survivors were moved to the Ypres Salient to help stem the German advance in that sector.” Ian Hook, of the Essex Regiment Museum, notes the 2nd Battalion defended trenches dubbed Chili, Harry and Hussar, and that by the end of March 28, 342 were listed as ”missing”. He also forwarded the official Arras Day Special Order, a description of the 2nd Battalion’s role in the battle, which was read out to the Battalion every March 28 1919-39. I've reproduced it below, but you might need a magnifying glass to read it, so in summary it says: the Battalion formed part of the British Army’s 4th Division, 13th Corps, 1st Army; the Battalion comprised 520 men when it entered the front line and that, on the night of March 30/31 when they were relieved, this had come down to 80 men, ”all ranks”; that when the German Army launched their massive infantry attack, ”almost shoulder to shoulder in 6 lines… the men in our front line who yet lived had no thought of surrender… Thus it was the great attack on Arras failed, and the XIII Corps gained a glorious victory. It was the sterling qualities of grit and endurance of the British soldier in the front line which achieved this success. Cut off from all support, away from higher control, Platoon and sections though isolated, carried out their instructions to the letter. They held out to the last man and the Enemy were only able to advance over their dead bodies… Arras was safe, and the price, ungrudgingly given by the Battalion was 440 brave men.” As I’ve noted elsewhere, I suspect my father would consider that “ungrudgingly” a rather oversimplificatory adverb. A timeline for the day and a list of officer casualties culled from the Battalion war diary is available at 1914-1918.invisionzone.com/forums/index.php?showtopic=118324. See also www.historyofwar.org/articles/battles_sommeII.html. A post script on Ludendorff: later a nationalist supporter of Hitler, he supported the total-war theory that peace could never be more than an interlude; his long-term strategy, if Germany had won World War I, included overrunning Britain and then the United States. Reproduced by kind permission of the Essex Regiment Museum's now retired curator, Ian Hook. A hundred years ago this week… the Western Front took over from the politics and skirmishing on the Eastern as the focus of attention – because of the variously named Spring Offensive/Operation Michael/Kaiserschlacht/First Battles Of The Somme 1918 (the last so dubbed by the British Battles Nomenclature Committee – imagine! – a body I’d never heard of before). The German strategy involved driving a wedge between the British and French armies, then pushing the British into the Channel. The opening Battle Of St Quentin (March 21-3), prefaced by the war’s greatest artillery bombardment – 3.5 million shells in a day, maybe one in five of them gas – saw the German Army, reinforced by troops freed from fighting the Russians, wield a 3-1 manpower advantage. Soon the British were conducting “a fighting retreat” which became a more fragmented defence as the Germans advanced under cover of heavy fog. Quickly, the Germans commander, General Ludendorff, swung the attack about 30 miles northwest for the Battle Of Bapaume (March 24-5). On the first day, after heavy shelling, the British evacuated the town and retreated. But the defeat began to look less decisive on day two as the British held a line from Bazentins and High Wood north to Arras (where the full German onslaught had not yet begun – and where my father FootSoldierSam and his comrades awaited developments under the usual massive bombardment, see below and the last several blogs). The German troops, meanwhile, got bogged down on those terrible old Somme battlefields. The French came under lesser attacks in Champagne, near Verdun, and in Lorraine, plus the psychological threat of the “Paris Gun” firing its (relatively small) shells 75 miles from Crépy-en-Valoison… to Paris. Alarming Field Marshall Haig, the French commander Pétain seemed to be thinking of splitting his forces away from the British – something the Germans had not yet achieved – to prioritise defending his capital. Action elsewhere looked minor by comparison, but the Egyptian Expeditionary Force, at this point in the shape of Anzac engineers and cavalry, pressed on from earlier gains to cross the Jordan and advance miles beyond it – under fire, they built five assorted bridges over three days (March 21-3) at a place called Makhadet Hilja. 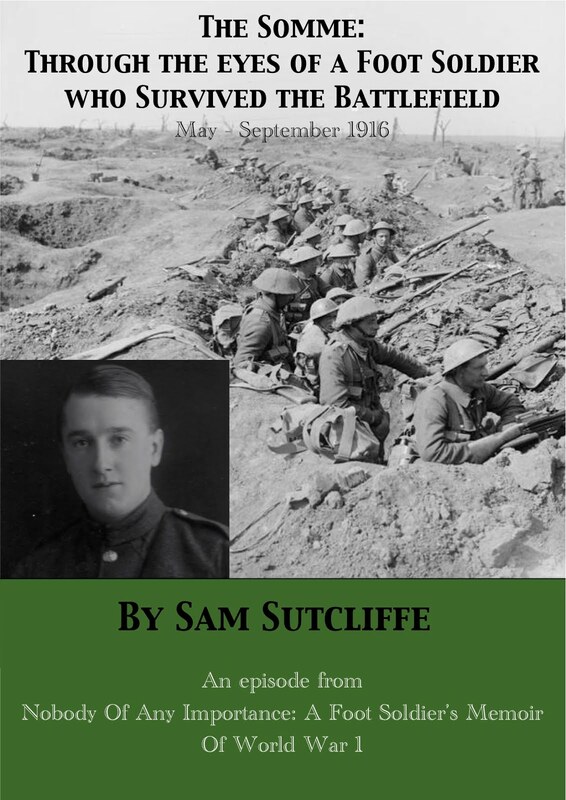 Last week*, on March 28, 1918, after my father Signaller Sam Sutcliffe took the midnight order from HQ which meant that C Company, and much of the rest of 2/7th Battalion Essex Regiment had to fight to the last man and bullet, he, his good Signaller friend Neston, and all their comrades stuck to their posts – despite the absence of any effective leadership above Sergeants and Corporals. When, suddenly, the artillery barrage lifted from our area, the relief we felt was quickly replaced by amazement at the sight of rows of huge, grey-clad men methodically taking over No Man’s Land, the space between the opposing armies’ most forward positions. Their battlefield method obviously similar to our own, they came on in lines, each numbering only 20 to 30 men, advancing in sections with first a forward-in-line movement, then swinging 90 degrees on the axis man at the end. Their officer in charge controlled movement by hand and whistle signals. Without waiting for orders — orders from whom, anyway? — we commenced firing. Thereafter, we paused only to reload our rifles and, in the mist, our targets appeared huge and unmissable. Our training, repetitious and at times seemingly unnecessary, was at last justified. We selected our targets, aimed so that the tip of the foresight was level with the shoulders of the back-sight, and sighted low on the human target. I will here describe an incident the memory of which has remained with me, clear and vivid in every detail; so much so that it affected an important decision I had to make 20 years later(2). In the desperate situation and amid the unnatural excitement, nervousness, and recurring moments of fear then being endured, one thing was proved beyond doubt ­– namely, that the intensive training one had undergone at various times during the past four years had achieved its purpose; when the situation required it, I became a rifle-firing automaton. Loading — transferring a bullet from its position in a clip of five in the magazine to its position in the firing chamber by working the bolt back and forth – took only a fraction of a second; a moment to sight the gun correctly on a target; squeezing, not pulling the trigger – well, no time really. Result: a man killed, wounded horribly maybe, and so bereavement in some family, or else sorrow over a son made an invalid or a cripple for life, all caused by one man’s impersonal automatic action. One target I dealt with was a man running not towards me but across my line of fire, about 50 yards distant. “Snapshooting at a moving target” on the firing range; back come the instructions, “Maintain normal aim, moving with the target, then increase movement of rifle till daylight appears between target and rifle then ‘Fire’”. The soldier fell… a comrade ran several yards to help him, appeared at the tip of my rifle fore-sight after I had rapidly reloaded, and I squeezed the trigger. As he too fell, the utter automatic callousness of my action registered somewhere in my brain and doubt nagged then and forever after about there being any plausible excuse for such murderous conduct. “If you hadn’t killed him he might have killed you”? Time seemed to be suspended… My ammunition pouches now empty, I took one bandolier of 50 from around my neck, laid it out before me on the parapet, opened its snap-fasteners and reloaded from it. Neston had no bandoliers so, when he ran out of ammo, I let him heave my other one off my shoulder. At one point he yelled, “Duck! Jerry half-right!” and in a split second I’d seen this tall German coolly standing a few yards away with his rifle trained on me, so down! quickly and phutt, the bullet just missed my helmet. A cautious peep revealed the tall Jerry, confident and careless man, sprawled on the ground facedown. Now I knew at last the feelings that take over when soldiers sense they have an equal chance in battle – that is, in the final face-to-face struggle. True, this feeling endured but briefly; as long, in fact, as we had a supply of bullets. But it was wonderful while it lasted – while we felt we were doing a soldier’s job reasonably well. The older man to my left died suddenly and painlessly; he was firing steadily, apparently devoid of any feelings of excitement. A strange noise near my left ear caused me to look at him; a sort of “cloink” it was. A neat hole towards the front of his right temple had appeared, but he remained standing briefly. I felt joy for him for a second, lucky man, life’s problems all solved now… But my rifle bolt had become over-heated and it was jamming – his gun rested across the parapet where it had fallen from his hands, so I took it. Men were moving along in the trench below and behind us looking for and calling for ammunition. I fired my last round. Neston had finished his lot and we could obtain no more. We made our own decision as to our next action. With difficulty, we forced our way through the milling mob – our defenceless comrades – in the direction of our dugout, because we intended to compose that final message and attach a copy of it to each of our lovely fantail pigeons. I collected several bruises, I guess, as one or two of our men seemed to resent our moving past them and I also suffered a couple of shocks – over and above the great prevailing shock, I mean. Looking upwards as we shoved and pushed I caught sight of one of our junior officers wandering aimlessly out in the open; half his face appeared to have been blown off and he vanished from sight and must surely have been riddled with bullets almost immediately. Then I saw a German not far from our trench, arm raised, about to throw a stick-bomb in my direction. I turned away, hoping to avoid the murderous thing, and it exploded on the parapet above me. This, I felt, was my lot, for with the shattering explosion came a stinging blow to the back of my neck. I clapped my hand over the injured part and gripped hard, determined to hold my head on at all costs. I raced after Neston, urging him to hurry to the shelter before I collapsed. Soon we were scuttling down the steps. Safe in the dugout, I withdrew my hand and was almost surprised that my head remained in place. Just a little blood in my palm – and a small, sharp bomb splinter lodged in the skin of my neck; I pulled it out easily. We found our basket and the pigeons all intact. The message we two devised had to be brief. It read, I believe, as follows: “No ammunition left. Almost surrounded by the enemy. Good-bye.” There followed details of our Company and Regiment. (2) My father wrote this passage on a separate sheet after completing his description of his final battle; he headed it “Murder” and added a note on the main manuscript instructing me to insert it at this point; the decision he took 20 years later, when he was 41 and World War II loomed, was to join the Civil Defence in London as an ambulance driver/first-aid expert, and not to enlist in the Army again – to save life, rather than kill, he told me.